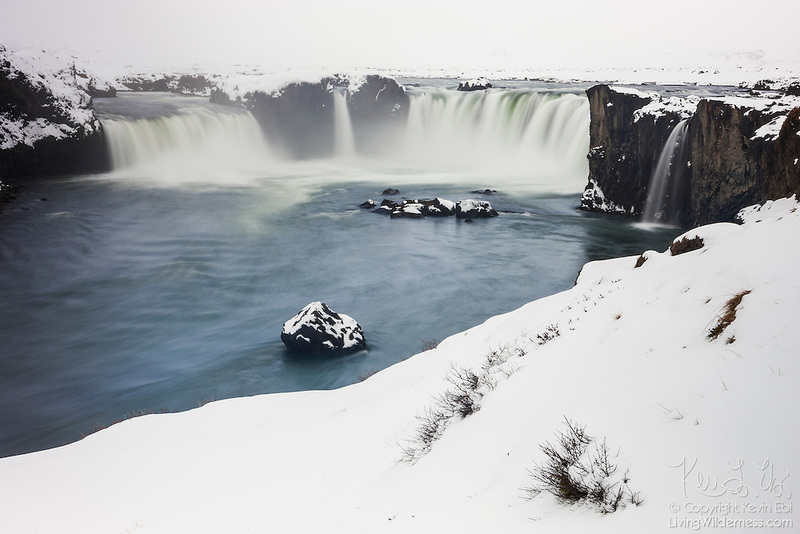 Heavy snow blankets the banks of Goðafoss, regarded one of the most spectacular waterfalls in Iceland. The name Goðafoss means "Waterfall of the Gods." Located near Mývatn, it plunges 12 meters and is more than 30 meters wide, and is the largest waterfall on the Skjálfandafljót river. The name, however, comes from Icelandic legend: in the year 1000 AD, Þorgeir Ljósvetningagoði, a chieftain in the region, threw his statues of the pagan gods into Goðafoss when he decided Icelanders should adopt Christianity.